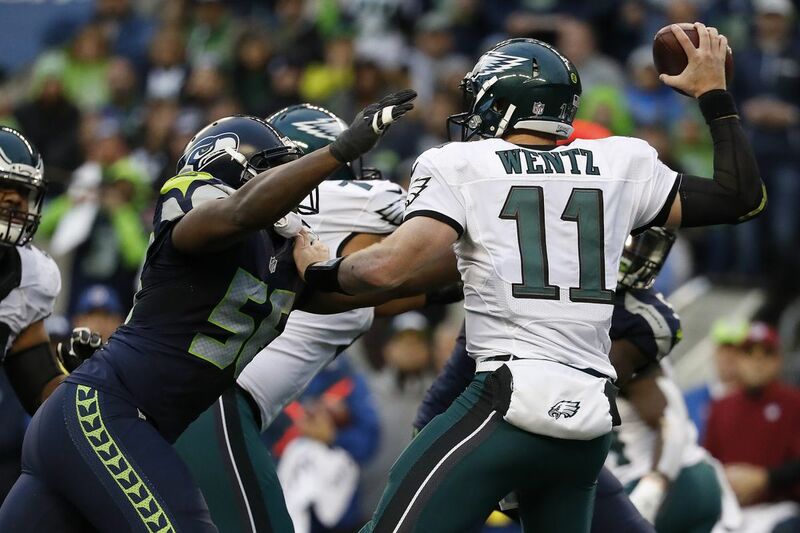 Eagles-Seahawks: TV announcers, referee info, point spread, etc. Carson Wentz will see a much more depleted defense in this year’s visit to Seattle. Cliff Avril, shown here about to force a fumble in last season’s game, is among the injured Seahawks who will not play Sunday night. Radio: 94WIP (Merrill Reese, Mike Quick, Howard Eskin). The Eagles have done an excellent job of focusing on one game at a time. Now it’s time to zero in on Seattle....not the Seahawks and the Rams. The Seahawks have had their share of injuries but Russell Wilson raises the level of everyone around him. Beware! Spanish Radio: La Mega, 105.7 FM (Rickie Ricardo, Gus Salazar, Maria Berral). Line: Eagles -6. Over-under: 47.5. Favorites took a bit of a hit after failing to cover both Sunday & Monday night. Last night, Ravens closed at -7.5...hopefully most got it at -7 and salvaged a PUSH. Weather.com: Cloudy, but dry. Temps in the 30s with light wind. Excellent football weather. Referee: Tony Corrente. The Eagles are 5-10-1 in games that Corrente has reffed since 1999. Corrente called Andy Reid's final game as Eagles coach in 2012, as well as that awkward tied game in Cincinnati in 2008 when some Eagles — including quarterback Donovan McNabb — didn't realize that NFL games could end in a tie. The Seahawks are 18-5 when Corrente is the referee, and have won six of the last seven. This will be the first time this season Corrente is calling an Eagles game and the second time he's seen Seattle, which beat the Giants in Week 7. History lesson: Seattle holds an 8-7 edge after last year's 26-15 win over the visiting Eagles. … The Eagles are 0-2 at Seattle in the Pete Carroll era. … The Eagles are the first road team to open as favorites in Seattle since 2012, when the Seahawks were getting four and beat the Patriots outright. Quick Seattle update: Quarterback Russell Wilson has more than twice as many rushing yards as any Seattle running back and has scored three of the Seahawks' four rushing TDs. … Defensive stars Richard Sherman (Achilles'), Kam Chancellor (neck) and Cliff Avril (neck) are out for the season. What's next: The Eagles stay out west and will play the Rams on Sunday, Dec. 10. The Rams will play at Arizona on Sunday. Did you know? The Eagles trying to win their 10th straight, which would be a franchise record. The Eagles also won nine in a row in 1960 and 2003, when they went on to win the NFL title and lose in the Super Bowl, respectively. … The Eagles have scored at least 30 points in five consecutive games. The Seahawks, uncharacteristically, have allowed 30+ in two of their last three home games. *Dallas is 5-6 entering Thursday night's game against visiting Washington.